Patrick and Robyn want peace. Pleeeease. Peeeeeace. In the scene with the Chamberlain and the Gelflings at the ruins, the original workprint had the Skeksis speaking an untranslated alien language except for this one scene, the only time in the original when the Chamberlain attempts English. That’s why he speaks in broken English here instead of complete sentences as elsewhere in the movie. There’s another interpretation of that scene. In Dark Crystal lore, there’s such a thing as “soul-speaking.” This is when Kira communicates with animals, Disney princess-style. A lot of fans believe that the Chamberlain has this ability as well, and is uses soul-speaking in this scene to mesmerize Jen, only for Kira to break the “spell.” It’s subtle, but you can kind of see it in the movie, especially how the music score comes in right at that moment. Re: The “soul-draining” chair. According to Brian Froud’s World of the Dark Crystal book, that room is called the Chamber of Life, and the device is called the Reflector, but the actual chair isn’t named. Look closely at the background in that scene, and you can see there are three of those chairs in that room. Great, now I want to watch The Dark Crystal again. i said it before and i'll say it again, the workprint version is far better than the theatrical version. for a long while i was not that warm toward the theatrical version. then a friend made me watch the workprint version and i fell in love with the movie. Blind bought Matinee - VERY excited to finally check it out! I agree 100% about People vs OJ Simpson - thank god Made in American came out that year and did the story justice. Re: waiting for the action scenes, I think that's what happens when the movie doesn't properly integrate the action with the story. I enjoyed The Villainess but the story was so complicated that it felt like a bit of a chore compared to the very clear action sequences. I just watched a video essay that goes into how Mad Max: Fury Road was able to tell its story through action beats rather than dialogue, and never actually had a script - just thousands of story boards! It took me two thirds of the podcast to realize I'd seen this movie back in the eighties. I don't remember any of it other than removing the living essence. Thanks so much for this, it was such an important thing for me and my brother when we were kids. Your discussion of what Henson's larger theme was really hit me, and was legitimately something I'd never really delved into. I love it when you talk about stranger movies that have so much depth to them, like your Mulholland Drive show back when. More please! Robyn is so infectious I love whenever she's on. You two have excellent chemistry when discussing movies. 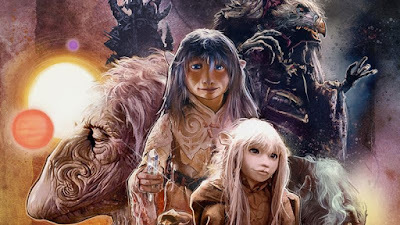 Anyway I digress, I haven't seen Dark Crystal in ages and I think it's high time for me to revisit it. I remember liking the score to the movie as a kid in the 90's.